A quick update to let you know that, taking our inspiration from Dai Vernon, we’ve taken a last-minute stand at the Square Meal “Venues & Events” exhibition at Old Billingsgate this week. It seems a good replacement for our previous annual stand at the RSVP show, which has sadly allowed itself to fall victim to the recession this year. “Venues and Events” is open this Wednesday and Thursday from 9.30am – 5.30pm; for more information please visit the Square Meal website. Michael Herbert and I will both be on the stand, so it will be a good opportunity to meet up and discuss how silhouette cutting might work at any events you may be planning this year. All this talk of a double-dip recession we’re hearing in the media reminds me of the famous American magician/silhouettist Dai Vernon. 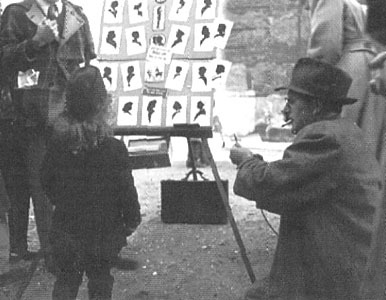 Vernon was an artist who invented many of today’s best-known magic tricks, but who actually supported himself and his family throughout the 1920’s and 30’s as a street silhouette artist. During the long years of the Great Depression he would set up a stall – in whatever city he happened to be working at the time – under a banner saying “no depression here”. Legend has it that he invariably had a long queue of customers! So, if you’re able to visit Square Meal’s “Venues & Events” exhibition this week, do make time to come and get your silhouette cut out. You’ll find us under the “no recession here” sign! 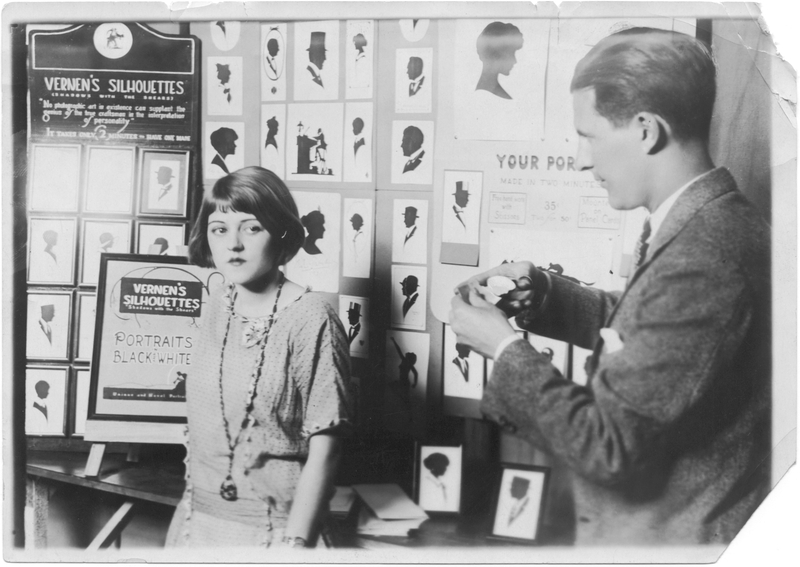 Archive photograph of Dai Vernon in his silhouette studio. The woman posing is his wife. 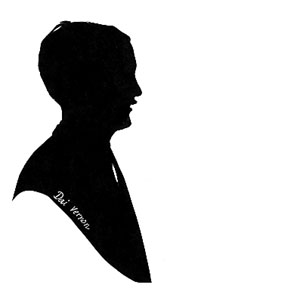 A typical Dai Vernon silhouette, with his trademark loopy signature. This one dates from 1931 and is from Michael Herbert’s collection. Almost every close-up magician working today will perform at least one Dai-Vernon effect on a regular basis. One of the best known is a trick called The Ambitious Card, in which the same card repeatedly appears at the top of the deck no matter how often it is pushed back into the middle. This was one of the tricks which made him famous. Vernon used it to fool Houdini, after Houdini had made a bet that nobody could fool him with a trick he hadn’t seen before or couldn’t work out. 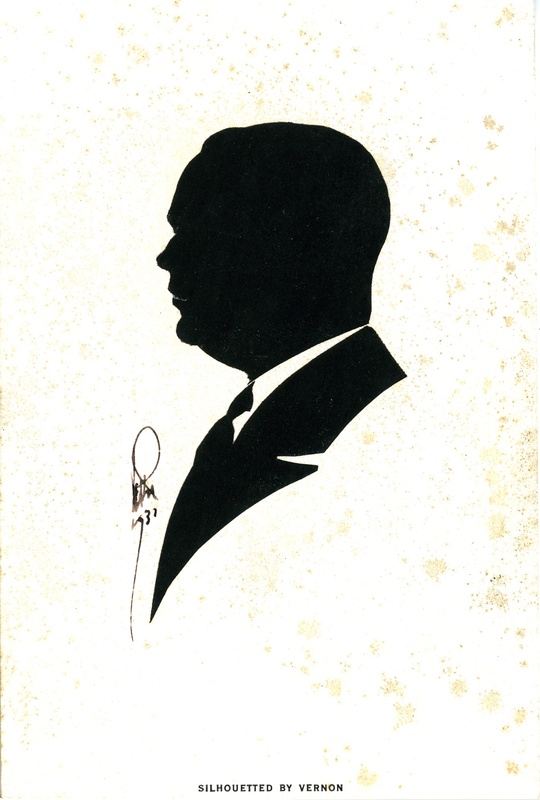 It was through studying the work of Dai Vernon that my friend Michael Herbert first became interested in silhouettes. Look out for the “no recession here” sign at Venues and Events this year.